I snapped this photo on Parliament Hill last night. After spending the past few days in our nation’s capital city, I am happy to be back in Edmonton (and happy to have no shortage of political intrigue to write about!). A big thanks to Edmonton-Mill Woods-Beaumont Member of Parliament Mike Lake for taking some time yesterday to show me around the Centre Block on Parliament Hill. It was very interesting to learn about how the Parliament building works from someone who has actually been elected to work there. While there, I also had the opportunity to be introduced to a number of other MPs, including Edmonton-Sherwood Park MP Tim Uppall and Crowfoot MP Kevin Sorenson, Carleton-Mississippi Mills MP Gordon O’Connor, and Thunder Bay-Rainy River MP John Rafferty (who were, of course, hard at work). As someone who spends most of his political watching at the provincial and municipal level, it was fascinating to see some of the differences and many similarities about politics in Ottawa. This entry was posted in Alberta Politics and tagged Gordon O'Connor, John Rafferty, Kevin Sorenson, Mike Lake, Tim Uppall on December 1, 2010 by Dave Cournoyer. Nice photo. Next time you’re in our nation’s capital, check out the Canadian War Museum if you have time. It’s an amazing place and in one afternoon I learned more Canadian history than I did in twelve years of grade school (almost anyways). Another great thing to do is have a meal, or at least coffee and dessert, in the Marriot’s revolving restaurant. Their views of the Parliament strip are pretty awesome from on high. Cool Dave. I’ve heard people say that the day that walking up to that tower *doesn’t* give you chills is the day you should quit politics. It gets me every time. When I was a young man, I rode my bicycle across Canada. “I’m going to dip my toe in the Atlantic Ocean,” I replied. “When you get to Ottawa, fart,” was his sardonic quip. 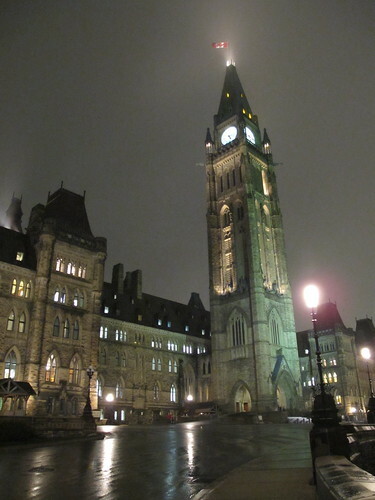 Sad to say, I can’t look at the Peace Tower now and not be reminded of some sort of flatulence….